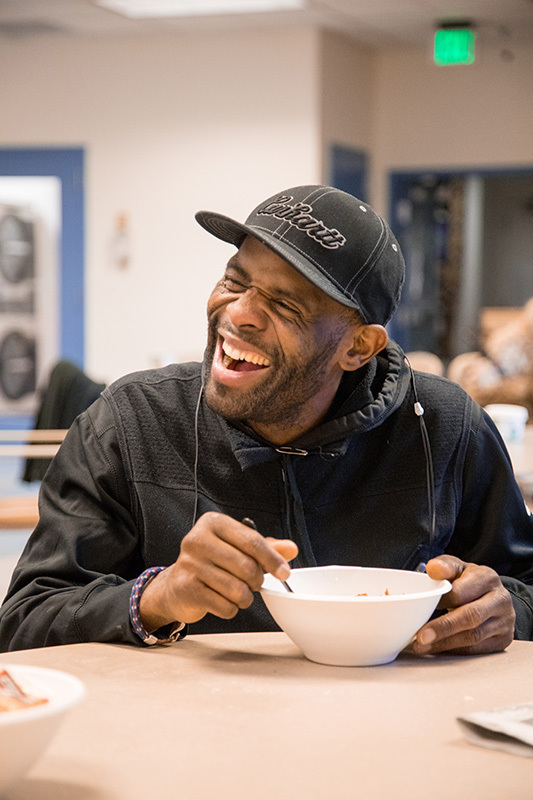 Jon, a Bailey-Boushay House client for 13 years, is facing his second bout with homelessness. He fell back into drug use and got behind on rent, leading to his eviction. He regrets not reaching out sooner when he needed help to save his housing. But even while he lives in a shelter, Bailey-Boushay is a lifeline. Jon has stayed clean and sober for more than two years. Outpatient clients are able to enjoy breakfast while they wait to meet with a case worker, or for medical care and medication management. There's a progression in helping homeless clients at Bailey-Boushay. Care may start with showers and meals, then medical care and medication management, or meeting a case worker and counseling. 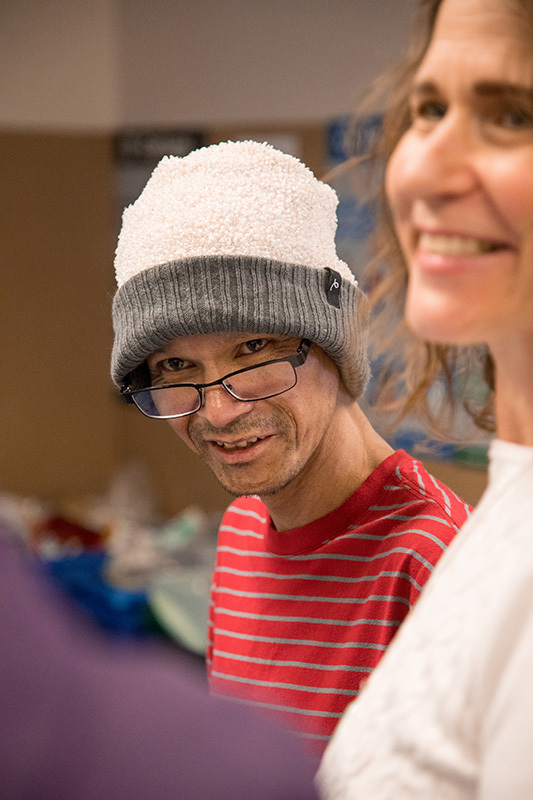 After a client's basic needs are met, there are opportunities for connection and to help address social and emotional needs. Bailey-Boushay client JR, who's achieved years of stable housing, still looks forward to sharing a meal with friends at Bailey-Boushay House, taking classes, participating in a book club, and especially “tea with Tiji,” a time to enjoy tea in china tea cups, and conversation with chaplain Tiji Murphy. Bailey-Boushay House provides a safe place for clients to socialize. After meeting for more than a year, clients participating in Bailey-Boushay’s Housing Stability Project Phase Two group laugh like old friends. Robert reminds everyone of his upcoming 70th birthday, so he’ll be in that morning to pick up his presents. When the laughter dies down, Robert shares a memory of being 17 and in the high school band – how could he be 70? “But he doesn’t even look it!” Antonio, a group member, interjects. “Not even a gray hair! But that’s the ‘Just for Men’ [hair dye].” Everyone erupts in laughter. Antonio tells the group it's his one year anniversary in his apartment, a milestone that reflects the success of the Housing Stability Project. A year ago, Antonio shared the upheaval of moving day. Now he relays the uncertainty of caring for a friend with chronic illness and feeling more determined to keep their plans for a fishing trip. The group can relate to Dan's story about waiting for a refund from the power company – they crack up when he says he’s got to quit hanging out by the mailbox – but they listen carefully when he admits what he’s really worried about. Billy Burton, clinical care manager and a group co-leader, offers to intervene if needed. Then Robert exaggerates his tough voice: “Do you need us to come over and deal with it?” Marie chimes in, “we’ve got your back Dan, full force!” Everyone is laughing again. Someone mentions an upcoming memorial service, and the room is quieter. A few people are surprised, unaware the client was dying. “He didn’t want to talk about dying,” group leader Angela Brock says. “He wanted to live his life.” People around the table nod. It’s what they want too.